Flemish artist Jasper Rigole collects other people’s memories. Films, photos and objects, so called 'memory documents' which he found in thrift shops and flee markets. 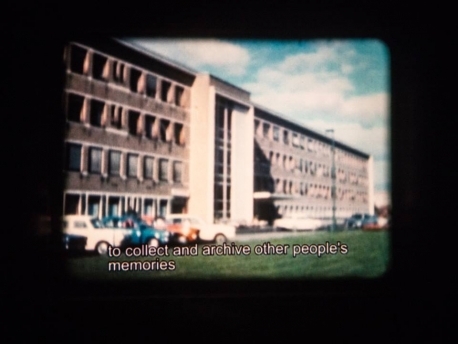 He archives them in his fictional institute (The International Institute for the Conservation, Archiving and Distribution of Other people’s Memories). These objects form the inspiration for the artist to create new meanings for these objects. During the opening, the performance Cinema Invisible took place, in which Jasper Rigole brought his sound archive of old tapes in dialogue with Heleen Van Haegenborgh (piano), Jürgen De Blonde (electronics) and Benjamin Glorieux (cello). The exhibition is open during evening programmes in De Brakke Grond.